On this week’s episode of A Taste of the Past, host Linda Pelaccio is joined in the studio by Krishnendu Ray, Department Chair of the Food Studies program at NYU. 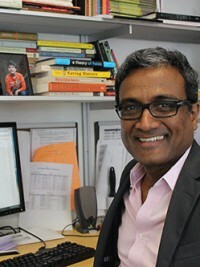 A food studies scholar, he is the author of The Migrant’s Table: Meals and Memories in Bengali-American Households (Temple University, 2004). He co-edited Curried Cultures: Globalization, Food and South Asia (University of California Press, 2012). His most recent monograph is The Ethnic Restaurateur (Bloomsbury 2016).